The beginning of Autumn is marked by an equilibrium between the amount of light of day and night. The equinox. A coming into balance. 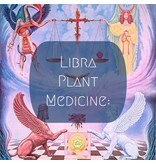 This season is ruled by the sign Libra, represented by the scales. In the human body this archetype corresponds to our kidneys, lower back and ears. The kidneys maintain the balance of acid/ alkaline and fluid/mineral in our personal ecosystems. On October 18th we will explore the herbal allies for finding and maintaining a healthy ebb and flow in our body and relationships.